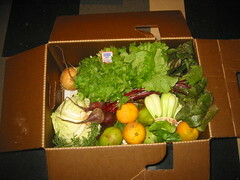 I am trying a new CSA (Community Supported Agriculture) from Full Circle Farm. The pick up location for it is one someones front porch in my location, which surprised me a lot, but is really cool too! My parents and brother recently also started doing a CSA, and my brother always says that he can taste the difference most in the carrots- so much crunchier and tastier than store ones. 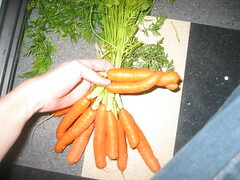 Probably helps that they are not big carrots whittled down to "baby" sized nubs.